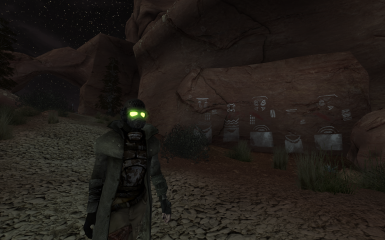 Makes the visors of all the Ranger Helmets (NCR, Desert, Riot, Advanced Riot, Elite Riot) have a neat glowing effect. Despite the name, this mod is actually quite complex in the way it goes about fulfilling its purpose. 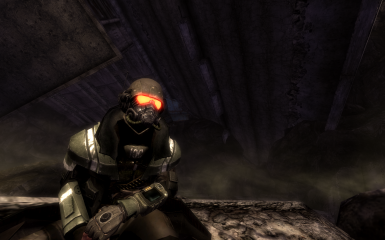 I'm aware of the existence of other mods that make the Ranger visors glow, however these mods are based off the look of the visors in the promotional artwork for the game, and after years of using those myself, I felt they actually gave this strange, disconnected feeling from the actual game world. In essence, it looks like the effect was painted on to the helmets, and isn't actually there. Additionally, very seldom do these mods "radiate" when they glow, so while they may glow in the dark, they don't "glow" in a believable manner. I've gone for an alternate effect with this mod, one that, in my opinion, feels more connected and believable in the game world. The textures have the flat color of their respective visor brightened on the texture itself. Then, through the use of matching, higher-resolution-than-the-default glowmaps and texture masks, are given an environment map to realistically reflect and react to lighting sources in the game, and in a different way than the rest of the helmet. This also helps the visors sell the effect of being made of a separate material than the rest of the helmet, even though it's all on the same texture. Through testing, I've lowered the brightness of the texture mask for all visors to a comfortable level so that the environment map can still be seen and reflects light adequately, but does not turn the visors too white as a result of some harsh lighting conditions, ruining the effect. Even if you can't see the environment map most of the time, it actually does help quite a lot with the radiant effect. In order to get the helmets to use these effects, however, I needed to edit the meshes of the helmets. As such, I've made versions for both the vanilla meshes, as well as the popular Ranger Helmet Neck Cover mod by Gopher (which is not required to download before this, as all necessary files are included). I've tested this mod without modifying the meshes, and I didn't find the resulting effect satisfactory. That said, the radiance of the glow effect is extremely dependent on the game's current lighting conditions, I.E. time of day, weather, the player's position relative to light sources, etc. There's no way for me to force the glow effect without making it look weird and unrealistic (I.E. the glow of the pip-boy buttons, which are just textures displayed over the currently selected category), I'd rather have it be dynamic like it is now. This is why I took screenshots in several different environments and lighting conditions to show how it changes. Also included for the Neck Cover version is an .esp file that hides the player's head while the helmets are equipped, preventing clipping with the neck covers. If you already have an .esp that does this, it should be okay to disable the included .esp as long as whatever you have affects all the Ranger helmets. 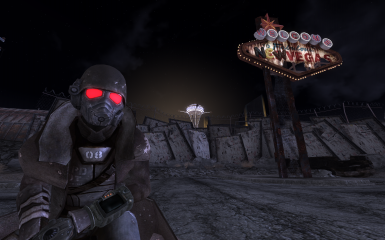 The .esp also fixes the weight on the Desert Ranger Helmet being 0 (now weighs 2 like the NCR Ranger Helmet), as well as fixes the Riot Gear helmets being labelled as "Heavy", and how they allowed other items like hats to be equipped at the same time. 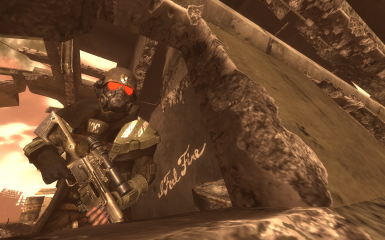 Lastly, I've also included a personal texture modification that I use and have aptly dubbed "Mama Forgives You". 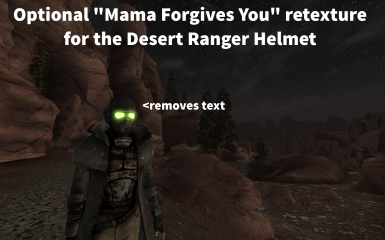 This file is a simple texture replacement for the Desert Ranger Helmet that removes the "FORGIVE ME MAMA" text and other writing from the helmet, making it look similar to the normal NCR Ranger Helmet. 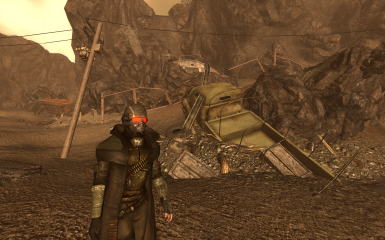 This is of course, in the context of the mod, so the texture also has the flat color of the Desert Ranger Helmet's visor in accordance with the rest of the textures in this mod.